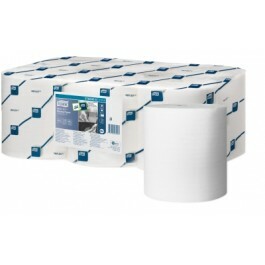 White 1ply Reflex excelCLEAN film wrapped centre feed rolls packed in 6's to fit the Tork Reflex dispenser. 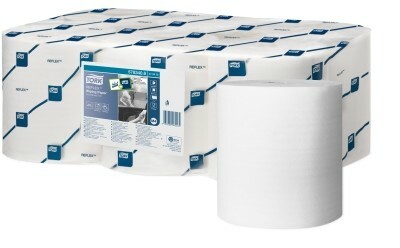 340 sheets per roll, sheet size 194x350mm. Reflex excelCLEAN is Tork's highest performing paper to date and is manufactured using TAD - Through Air Drying technology. The cores are also manufactured without cores, meaning less waste and mess and also far more environmentally friendly than a standard cored roll. The Tork Reflex Wiper System is a single sheet centre feed dispensing system. Reflex is designed to be used anywhere and is ideal in front of house situations, such as restaurants and pubs as its one hand use delivers fast and controlled wiping, so you can keep working on the go. The key selling point of the system is its one sheet dispensing, continuous streaming of the rolls is impossible - unlike standard centre feed rolls, therefore dramatically reducing its cost in use. Provides better and faster absorption. Coreless rolls save time in preparation and when loading, and leaves no mess.